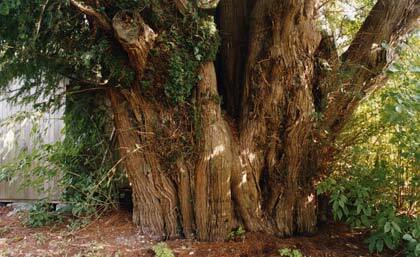 Notes: This yew first had its girth noted as early as 1869, when 21ft was recorded. At the time of my first visit in 1998 I noted that it had to share its space with a large shed that almost touched the tree, as well as an oil drum. The sequence of photos shows that over time the tree has been used more and more to hide piles of rubble, rubbish sacks and bins. These can all be removed, but the siting of what looks like an oil tank beneath the tree's branches is surely not an acceptable way to treat an 800+ year old tree.